Thousands of visitors come to Anza-Borrego Desert State Park® each year to enjoy the beauty of unique and captivating desert wildflowers in bloom. With 92 different plant families, 346 genera and hundreds of flowering species, there is quite the variety of flora to discover! There are many factors that determine when, how many and which blooms will appear in any given season. A combination of sun, rain, temperature and wind set the stage for the springtime arrival of wildflowers. So, when is the best time to experience this phenomenon? That is one of the most frequently asked questions at Anza-Borrego Desert State Park! It is very difficult to answer, as each year’s conditions can vary greatly. However, the second week of March is often the peak of the wildflower bloom. When all conditions are perfect you will see the carpets of flowers you often see in the media. Click here for a downloadable wildflower location map. Visitor Center area: Perennial shrubs, trees, late annuals, and cacti in Visitor Center garden; alongpaved trail to campground; walk cross-country west of our parking lot; walk back into Hellhole Canyon. Borrego Palm Canyon : Alternate Trail (starts a short way up the paved path to the campfire center) and Main Trail both have flowers. Notice the Indigo Bush. Search for Apricot Mallow. 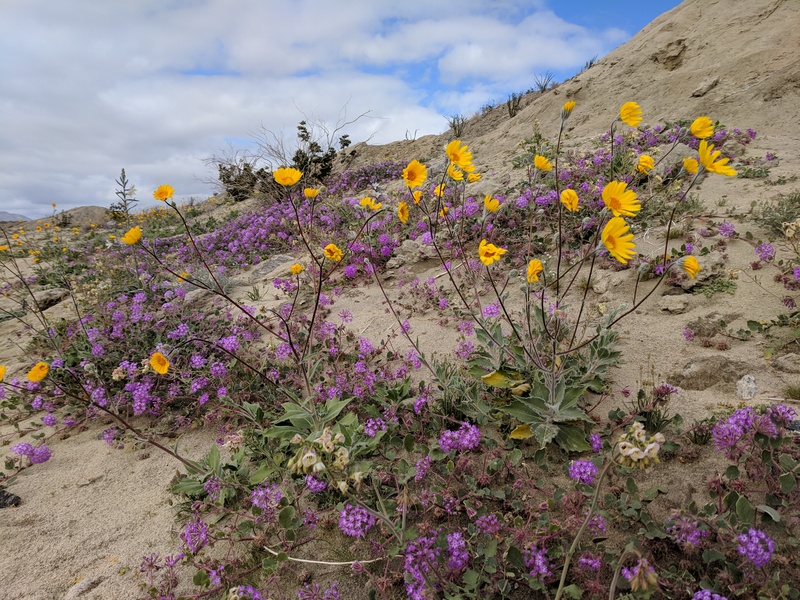 Montezuma Valley Road: As you drive between Ranchita and Borrego Springs, scan the mountainsides for brittlebush, cacti, ocotillo, and a few surprises. Ocotillo Forest: South from Borrego Springs on Borrego Springs Road; many ocotillos in bloom. Highway 78 Corridor & Plum Canyon: Walk or drive (2WD vehicles should stay right at fork) for dispersed shrubs, cacti, agave, and succulents on the canyon wall. Continue up the Riding and Hiking Trail for scenic view. Try also the Cactus Loop Trail (across S-3 from Tamarisk Grove) for cacti in bloom. Highway 78 Corridor & Mine Wash: Walk or 4WD to the Village Site and beyond for cacti, brittlebush, and desert lavender in bloom. Explore the Village Site. Hwy S-2; Blair Valley to Vallecito County Park: Enter near mile marker 23 on Highway S-2 for large primitive camping area, good flowers, and short hikes to the Morteros and to the Marshal South Homesite. Vault toilet. Only 4WD vehicles should attempt to go beyond Morteros trailhead to the Pictographs trailhead. Continue on S-2 for roadside cacti, phacelia, agave, yucca all the way to Vallecito County Park. Flowers are blooming in many areas around the Park. Most of these places require high clearance and/or four-wheel drive capacity. Don't have a four-wheel drive vehicle? Never fear, here are a few ways you can plan your trip to have a safe and quality experience in the Park to view wildflowers. Take a Hike: Come prepared for hiking into some of the most beautiful areas by bringing sturdy shoes, layers of clothes, hat, sunscreen, water and snacks. Stop by the Park Visitor Center or the Anza-Borrego Foundation State Park Store for information on where to go. B ike It: Bring your mountain bike or rent one from Bike Borrego. levels of fitness and cycling experience to get our into the Park. Overland It: Plan a desert tour with our friends at California Overland. incredible resources of Anza-Borrego Desert State Park. 1. Sign up for ABF’s email updates to receive communication about the bloom. 2. Check Anza-Borrego Desert State Park's website for road conditions, safety tips and best routes to take when traveling to the Park or call the Visitor Center at 760-767-4205. 5. Visit our State Park Store for free information, wildflower brochures, books, and all your needs for heading out into the desert. 6. 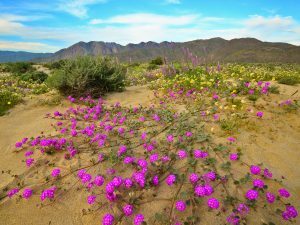 Plan your stay in advance, visit Reserve California to book a site for camping in Anza-Borrego Desert State Park.